An often overlooked pattern is the cripple be it a drake, PMD or a midge. The term cripple describes a range of insects with a common characteristic. For one reason or another they cannot leave the water and remain trapped on or in the surface. The emerging insect may have become exhausted or otherwise is unable to satisfactorily emerge from its shuck. It may be injured. It is trapped in its shuck or casing and lies helplessly in the film. A fully emerged dun which has been blown back on the surface of the water and is unable to fly away will also be included in this description. It is easy pickings for a fish. The cripple will drift in the current to the eddies and slowly die. Although not a cripple in the sense that it has left the water, the spinner which also lays helplessly on the water is equally easy prey for a trout. The most important thing to remember with a cripple, is that it is helpless. Therefore it will have no strength of its own to fight the current or drift. When fishing a cripple pattern, let the fly drift with no drag. High-sticking will help. In addition, try and ensure that the leader does not pass over the waiting fish as the fly approaches. A leader shy fish will be alerted to a leader drifting over its head if one casts straight up a stream or river. It is therefore preferable to cast across the current so that the fly will drift into the fish's field of vision without the leader preceding it. Where the casting area is narrow, hooking the fly at the end of the cast will cause it to go sharply either left or right. This will case the fly to fall on the water away from the leader and therefore not drift over the same water as the leader. The other thing I like to do is to grease the line to get it to float on the surface. When casting, flick the line forward to release the tension with the water. This will limit the drag on the fly when the line is taken off the water. 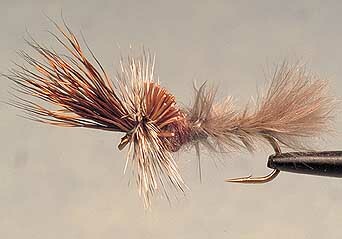 The parachute dry fly style allows the fly to sit low on the surface film, mimicking either a spent spinner, an emerging mayfly dun filling its wings, a stillborn, floating nymph or a crippled drowning fly trapped in the surface film. In addition, we have a range of cripples in the shop which are worth considering on your next journey. Here are three patterns tied by Umpqua. They give you an idea of the approach adopted by the tiers. 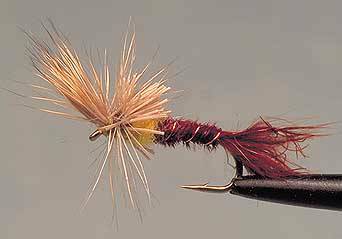 We have a range of cripples and are having some interesting patterns tied to emulate midges. When next in town, come and have a look at some of the clever ideas some of the designers have developed.